The 'Bloody Code' was the name given to the English legal system from the late 17th Century to the early 19th Century. It was known as the Bloody Code because of the huge numbers of crimes for which the death penalty could be imposed. It would seem as if every crime was punishable by death in the 1800s, even those which we would consider to be very minor or trivial today such as stealing a rabbit. There were many reasons why the English legal system was so harsh at this time. Attitudes of wealthy men who made the law were unsympathetic. They felt that people who committed crimes were sinful, lazy or greedy and deserved little mercy. As the rich made the laws they made laws that protected their interests. Any act which threated their wealth, property or sense of law and order was criminalised and made punishable by death. You could be executed for stealing anything worth more than five shillings (equivalent to approximately £30 today)! The law was also to act as a deterrent. It was thought that people might not commit crimes if they knew that they could be sentenced to death. This was also the reason why executions were public spectacles until the 1860s. The authorities believed that hanging criminals in public would frighten people into obeying the law and refrain from commiting crime. 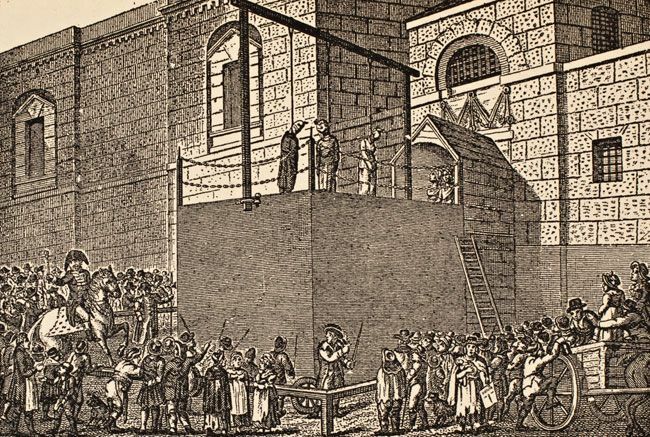 Read an account of a prison of this time, Newgate Prison known as Hell above Ground.